The Varnished Culture had previously set out a prescription for the correct staging of Wagner’s greatest one-off, Tristan und Isolde. Now we had the chance to see if the Met would rise to our vision, in opening its 50th season at the Lincoln Centre. It didn’t, but there were still good things in it. The orchestra under Simon Rattle was superb. Each of the three sublime Acts carry various challenges, including the liaisons with the singers, and all were handled impeccably, to this ear at any rate. 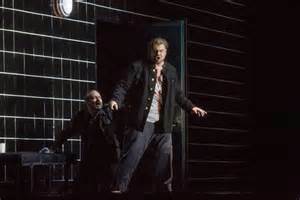 Met favourite Nina Stemme was Isolde; Stuart Skelton (Siegmund in the 2013 Melbourne Ring) was Tristan. She was tremendous – crisp and clean of voice and true to the emotional weight of the role, which she conveyed with subtlety rather than the more common histrionics. He, on the other hand, has work to do. Not the least of these is to get a little lighter on his feet – as he wobbled and blundered about the stage, he suggested less a man whose mind is a whirl with passion than an overstuffed cabbage looking for a pork pie and a lie-down (pardon the mixed metaphors). His voice is excellent; his acting indifferent. But he will grow into the role. Ekaterina Gubanova as Brangäne was the stand-out – her voice was rich, particularly the second act’s offstage warning, which the filmed visuals actually enhanced, for once – and her rendering of this particularly problematic character was moving and error-free. The screened visuals owed a lot to Lars van Trier but did not totally distract from the real focus, which is Wagner’s artistic elevation of the carnal to the divine. 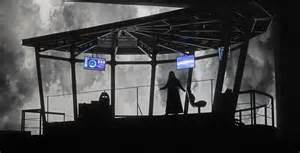 The roily sea was spot on; the World War II (and post-war) touches (a torpedo boat straight from a script by Joe Gilles; radar, CCTV, the armaments cellar, Isolde’s garden replaced by the bridge of the Starship Enterprise. etc.) jarred substantially, along with some very dodgy militaria: King Mark (René Pape) is dressed as Tom Cruise in A Few Good Men; Tristan gets about in tent-sized air force blue, the colour of which is the only thing navy about it; Kurwenal (a very good Evgeny Nikitin) and company are decked out as mercenaries and many of the others leather-up like the Gestapo, or members of the Resistance (though better-fed). The red illuminated signals fitted an airstrip better than a warship. I tried not to let all this bother me (at least there were no sado-shorts) but greater ‘distractions’ were to come. Tristan and Isolde is Wagner’s most mystical, ethereal work, and the doomed couple represent romanticism at its zenith. Their deaths are meant to be transfigurative. So the spectacle of Isolde, slashing her wrist and bleeding-out, undermined, for me, the Liebestod to a degree, i.e. by a little under 100%. I expected to see, as the programme notes described, Isolde expiring “in a rapture of ecstatic love,” but I’d obviously missed any trigger warnings of textual vandalism.